Diversify the revenue streams of your VIP organization in GTA Online this weekend with huge GTA$ bonuses and much more in the Executives and Other Criminals Event Weekend. This weekend in GTA Online Rockstar is giving you the opportunity to build up a nest egg to purchase your first Yacht, Conker Avenue Stilt House or even your own SecuroServ VIP organization. The Executives and Other Criminals Event Weekend contains multiple ways to earn Double GTA$ as well as RP boosts and significant discounts on the tools you need to live the life of a true mogul or make a name for yourself in security detail. Like any business, legitimate or otherwise, expansion requires investment and a focus on the bottom line. Your biggest profit margins this weekend can be found playing Double GTA$ & Double RP Adversary Modes. As is standard, a simple one button launch from the GTAV start screen puts you directly into a Playlist featuring the brand new Adversary Mode Extraction. The perfect arena in which to hone your SecuroServ skills, Extraction sends in a team of Bodyguards to work with their team member, the Target - stranded after a plane crash - to rendezvous in the extraction zone and get them to the evac point. They're up against the opposing Hit Squad who have caught wind of the operation and are on a mission to take out the Target. With GTA Online: Executives and Other Criminals, the ultimate symbol of wretched excess - your own luxury Yacht - is now available to purchase. To get your sea legs ready for a life on the open water, Rockstar is doubling the GTA$ bonuses on all Sea Races all weekend. Those extra dollars will come in handy when customizing your new Yacht, whether you go for the standard Orion, or go all in on the ultra-deluxe Aquarius which comes complete with a Hot Tub and a new SuperVolito Carbon helicopter. If you're worried about keeping your new Yacht in pristine condition, don't miss the 50% off discount on RPG Rockets to get the upper hand in Piracy Prevention, Executive Search or any of the other VIP and Bodyguard Freemode games. For those needing new arms and extra ammo, look out for the 50% off discount on Sniper Rifles (perfect for taking out any VIPs without having to engage their Bodyguards); grab the 50% discount off Pistol ammo for your brand new Heavy Revolver and for those wanting a signature look to their weaponry, there's a 50% discount on gun engravings. Finally, to ensure you can always get yourself to your new Yacht this weekend (or prepare to board someone else’s), Rockstar will also be featuring 25% off all Docktease Services for whatever your aquatic needs may be. Since it's impossible to fully enjoy an extravagant purchase without sharing a photo of it on social media, make the most of the Snapmatics you're taking by entering Rockstar's #Executives Snapmatic Contest. Five Snapmatic photographers who publish the greatest Executives & Other Criminals Snapmatics will win GTA$1,000,000 towards their next Yacht or Stilt House. Eligible photos must be published before end-of-day Sunday Dec 20, and must feature content from Executives & Other Criminals, whether it's a new vehicle, weapon or fun times aboard your majestic sea-faring monolith. 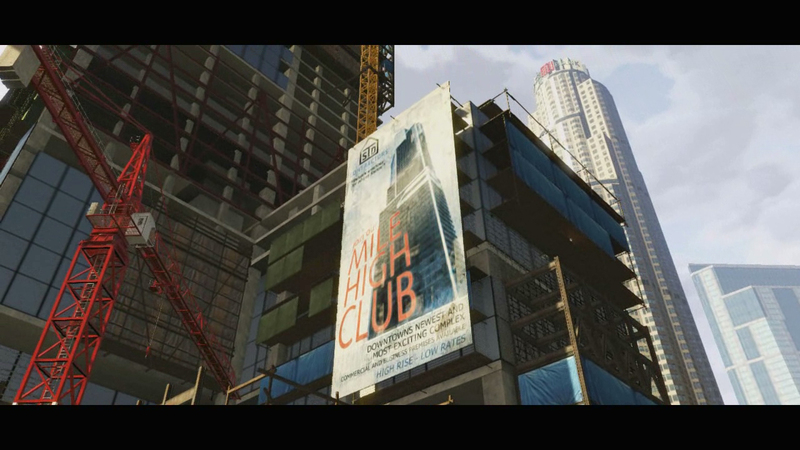 Don't forget to tag your photo with "executives" on Social Club. Full rules can be found here. You'll want to match your in game trappings of the executive lifestyle with some real world finery, so head over to the Social Club Events Page now and enter for the chance to grab a sack full of presents, perfect for gifting to loved ones or hoarding for yourself this upcoming holiday season. The ideal stocking stuffer is the GTAV engraved chrome Zippo lighter, perfect for commemorating the purchase of your new Stilt House with a fine cigar. SecuroServ VIP organizations come complete with a variety of outfits for your Bodyguards to wear, so get in the spirit of this organized crime with the Grotti Polo shirt and the classic GTAV black hoodie. There's also the GTAV kitchen magnet, Epsilon paperweight and magnetic kitchen timer to make your IRL Penthouse Apartment feel like home, and of course you'll need to be on guard around your yacht, particularly if someone has too much champagne before getting in the Hot Tub. Look the part with the Los Santos Lifeguard t-shirt. This Friday Dec 18th at 5pm ET, tune in to the official Rockstar Games channels on Twitch and YouTube as the Rockstar Broadcast team plays through every single map of the brand new Adversary Mode Extraction, as well as the new VIP and Bodyguard gameplay in Freemode with special guests including Ltzonda, Deanabean, Mattophobia, plus Knox and Jester from the storied Hillbilly Agenda Crew and more. They'll be checking out the latest vehicles including the armored versions of the Gallivanter Baller, Enus Cognoscenti and Benefactor Schafter and will also be firing the Rockstar Broadcast t-shirt cannon at the very end of the stream for your chance to score rare in-game tees. Lots of fun this weekend! Hit up the forums! 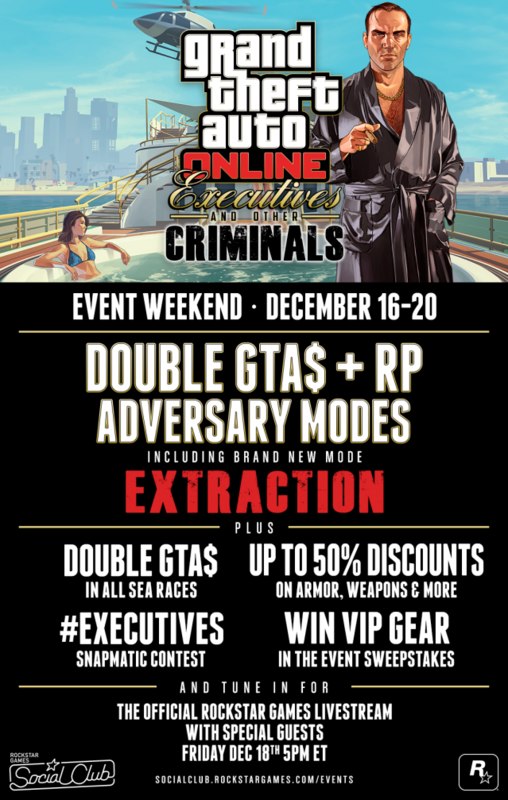 Executives and Criminals Event Weekend - An event weekend to celebrate the new Executives and Other Criminals DLC.